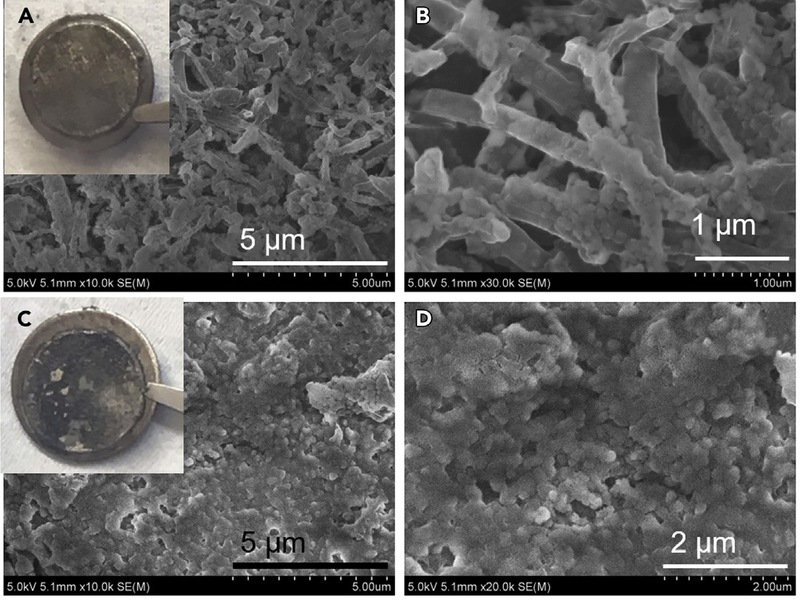 SEM images of cycled Li-metal anodes obtained from 1 M LiFSI EC/DMC (EC:DMC = 1:1) (A and B) and from 10 M LiFSI EC/DMC (C and D). Insets in (A) and (C) show the optical images of cycled Li foils on the spacers. A healthy brain cell, or neuron, looks similar to a tree with a full canopy. The ‘branches’ are called dendrites, which receive electrical signals from other cells. Those signals are spread throughout the body and end in simple actions, such as wiggling a finger or blinking an eye; thus, they are absolutely necessary to healthy brain function. Despite this issue, Li-metal is still regarded as the ‘holy grail’ in the scientific community, which is why researchers at the University of Maryland (UMD) continue their quest to solve the dendrite issue. Researchers in the UMD Department of Chemical and Biomolecular Engineering (ChBE) - led by ChBE Professor Chunsheng Wang - have recently created a battery chemistry that successfully suppressed dendrite formation in Li-metal batteries by increasing the LiFSI (Lithium bis[fluorosulfonyl]imide) salt concentration in the electrolyte. Xiulin Fan, Long Chen, Xiao Ji, Tao Deng, Singyuk Hou, Ji Chen, Jing Zheng, Fei Wang, Jianjun Jiang, Kang Xu and Chunsheng Wang. “Highly Fluorinated Interphases Enable High-Voltage Li-Metal Batteries.” CHEM 4, 1-12; January 11, 2018. DOI: 10.1016/j.chempr.2017.10.017.